Weatherwise Magazine has announced the winners of its 2016 Weather Photo Contest. 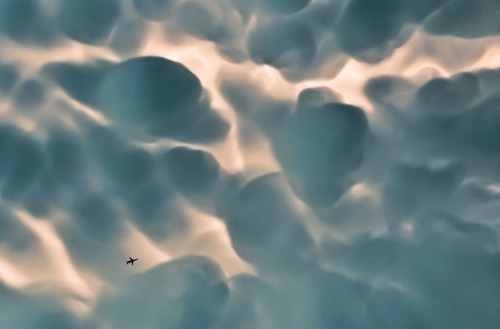 Grand Prize was awarded to Fred Wasmer of Gainesville, Fla., won for his picture of a jet aircraft flying underneath a bank of mammatus clouds. Grand Prize. Fred Wasmer's shot of a jet under mammatus clouds. Margaret Benner Smidt, editor of Weatherwise, said, "The judges were impressed by this year's particularly robust selection of photos. There were many that could have made the grade as winners." Judges chose 14 photos that "best exemplify the power, beauty and excitement of weather. The photos selected balance quality of image with rarity of the phenomenon photographed," Benner Smidt said. Until Oct. 31, you can see the winning photos by visiting the magazine's Web site. Photos came in from around the country, but in the end, there was only one Grand Prize winner in Weatherwise Magazine's 2016 Photo Contest: Fred Wasmer of Gainesville, Fla., won for his picture of a jet aircraft flying underneath a bank of mammatus clouds. According to Margaret Benner Smidt, editor of Weatherwise, said, "The judges were impressed by this year's particularly robust selection of photos. There were many that could have made the grade as winners." The panel of judges, which consists of Bob Ryan, former president of the American Meteorological Society; Stanley David Gedzelman, a retired professor of meteorology at the City College of New York; and Doyle Rice, Weather Editor at USA Today, had a tough time selecting the winners. In the end, Benner Smidt says, they chose the 14 photos that "best exemplify the power, beauty and excitement of weather. The photos selected balance quality of image with rarity of the phenomenon photographed." Some of the best photos this year were of crepuscular and anti-crepuscular rays, auroras, funnel clouds, dust devils, banner clouds, lenticular clouds, arc clouds, mammatus, coronas and halos.